Household pollutants are contaminants that are released during the use of various products in daily life. Studies indicate that indoor air quality is far worse than that outdoors because homes, for energy efficiency, are made somewhat airtight. Moreover, household pollutants are trapped in houses causing further deterioration of indoor air quality. Hazardous household products fall into six broad categories: household cleaners, paints and solvents, lawn and garden care, automotive products, pool chemicals, and health and beauty aids. Many commonly used household products in these categories release toxic chemicals. As an alternative, manufacturers are introducing products, often referred to as green products, whose manufacture, use, and disposal do not become a burden on the environment. 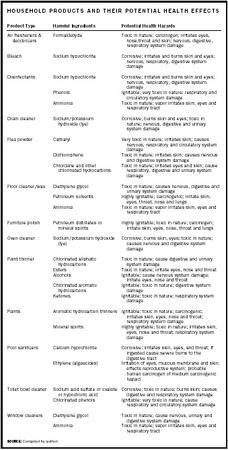 Many household products like detergents, furniture polish, disinfectants, deodorizers, paints, stain removers, and even cosmetics release chemicals that may be harmful to human health as well as cause environmental concerns (see the table, "Household Products and Their Potential Health Effects"). Insecticides, pesticides, weed killers, and fertilizers that are used for maintaining one's lawn and garden are another source of household pollution. Their entry into the house could occur through air movement or adsorption by shoes and toys, which are then brought inside the house. A common class of pollutants emitted from household products is volatile organic compounds (VOCs). Sources for these pollutants include paint strippers and other solvents, wood preservatives, air fresheners, automotive products, and dry cleaned clothing. Formaldehyde is a major organic pollutant emitted from pressed wood products and furniture made from them, foam insulation, other textiles, and glues. Exposure to very high concentrations of formaldehyde may lead to death. Air refresher Open windows to ventilate. To scent air, use herbal bouquets, pure vanilla on a cotton ball, or simmer cinnamon and cloves. All-purpose cleaner Mix ⅔ cup baking soda, ¼ cup ammonia and ¼ cup vinegar in a gallon of hot water. Doubling all the ingredients except the water can make stronger solution. Brass polish Use paste made from equal parts vinegar, salt and flour. Be sure to rinse completely afterward to prevent corrosion. Carpet/rug cleaner Sprinkle cornstarch/baking soda on carpets and vacuum. Dishwashing liquid Wash dishes with hand using a liquid soap or a mild detergent. Drain opener Add 1 tablespoon baking soda into drain and then slowly pour ⅓ cup white vinegar to loosen clogs. Use a plunger to get rid of the loosened clog. Prevent clogs by pouring boiling water down drains once a week, using drain strainers, and not pouring grease down drains. Fabric softener Use ¼ to ½ cup of baking soda during rinse cycle. Fertilizer Use compost and organic fertilizers. Floor cleaner Mix 1 cup vinegar in 2 gallons of water. For unfinished wood floors, add 1 cup linseed oil. To remove wax buildup, scrub in club soda, let soak and wipe clean. Floor polish Polish floors with club soda. Furniture polish Mix 1 teaspoon lemon oil and 1 pint mineral oil. Also, use damp rag. Insecticides Wipe houseplant leaves with soapy water. Laundry bleach Use borax on all clothes or ½ cup white vinegar in rinse water to brighten dark clothing. Nonchlorinated bleach also works well. 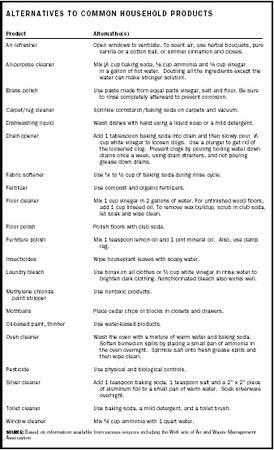 Methylene chloride paint stripper Use nontoxic products. Mothballs Place cedar chips or blocks in closets and drawers. Oil-based paint, thinner Use water-based products. Oven cleaner Wash the oven with a mixture of warm water and baking soda. Soften burned-on spills by placing a small pan of ammonia in the oven overnight. Sprinkle salt onto fresh grease spills and then wipe clean. Pesticide Use physical and biological controls. Silver cleaner Add 1 teaspoon baking soda, 1 teaspoon salt and a 2" x 2" piece of aluminum foil to a small pan of warm water. Soak silverware overnight. Toilet cleaner Use baking soda, a mild detergent, and a toilet brush. Window cleaner Mix ¼ cup ammonia with 1 quart water. building construction prior to the 1970s (e.g., lead-based paint used to paint homes). There are several steps one can take to reduce exposure to household chemicals. An adjacent table provides a list of alternative products. One can bring unused and potentially harmful household products to a nearby chemical collection center; many communities have such a center. Chemicals received at these centers are recycled, disposed of, or offered for reuse. One may also purchase just the amount needed or share what is left over with friends. In addition, one should always avoid mixing different household chemicals. Most of the chemicals released during remodeling projects are toxic in nature, and some of them are even carcinogenic. Proper care, such as employing wet methods for suppressing dust, use of high-efficiency filters to collect fine particulates, and sealing the remodeling area, must be taken while remodeling to prevent the emission of harmful chemicals into the surrounding air. Reducing material use will result in fewer emissions and also less waste from remodeling operations. Another good practice is to use lowenvironmental-impact materials, and materials produced from waste or recycled materials, or materials salvaged from other uses. It is important to avoid materials made from toxic or hazardous constituents (e.g., benzene or arsenic). Indoor air quality should improve with increasing consumer preference for green products or low-emission products and building materials. Green products for household use include products that are used on a daily basis, such as laundry detergents, cleaning fluids, window cleaners, cosmetics, aerosol sprays, fertilizers, and pesticides. Generally, these products do not contain chemicals that cause environmental pollution problems, or have lesser quantities of them than their counterparts. Some chemicals have been totally eliminated from use in household products due to strict regulations. Examples include the ban of phosphate-based detergents and aerosols containing chlorofluorocarbons. 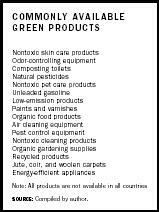 A list of green products available in the United States and other countries is provided in an adjacent table. Materials like plaster boards, urea-formaldehyde foam insulation, soldering glue, switches, and panel boards, which are known to cause indoor air quality problems, have been substituted with other eco-friendly products, which serve the same purpose but have low emissions. I NDOOR A IR P OLLUTION ; L EAD ; P ESTICIDES ; R ECYCLING ; R EUSE ; VOC S (V OLATILE O RGANIC C OMPOUNDS ) . Baird, Colin. (1999). Environmental Chemistry, 2nd edition. New York: W.H. Freeman. Confederate Chemicals Limited Web site. Available from http://www.poolandspachemicals.co.uk . Ecology America Web site. Available from http://www.ecomall.com . Occupational Safety and Health Administration (OSHA) Web site. Available from http://www.osha-slc.gov/SLTC/indoorairquality . The styrene-butadiene (SB) latex backing that is used on most new carpets is a source of styrene and 4-phenyl cyclohexene (4-PC). Styrene is a known toxic and suspected carcinogen. 4-PC is not known to be toxic, and it continues to be emitted at measurable levels for a longer time because it is also less volatile. Vinyl-backed carpets emit an entirely different set of chemicals, notably vinyl acetate and formaldehyde. Health complaints associated with carpets include severe neurological and respiratory problems; health problems usually arise more frequently in individuals with multiple chemical sensitivities or sick building syndrome. Carpet material may not be the largest contributor to indoor air quality problems after a new carpet has been installed. Studies indicate that carpet adhesives and seam sealants emit far more pollutants, especially in the first seventy two hours after installation. Carpet cushions, or pads, may be at fault as well. The majority of adhesives are based on SB latex and generally the most significant short-term source of VOC emissions. Since 1991, adhesive manufacturers have been actively researching ways to reduce solvent levels even further, and by 2002 some claimed a calculated VOC level of zero. Seam sealants, another major culprit, release known toxins, including toluene and 1,1,1-trichloroethane. It was exteramly inspiring and tought me alot about waht alternatives i could use BUT you did not tell us an alternative to deoderant. Wow! A lot of this I knew...But this was really helpful for my report I did for Biology! !